J.D. 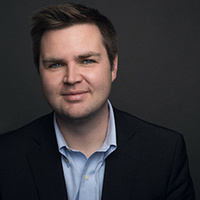 Vance is an investor, commentator, and author of the #1 New York Times best seller Hillbilly Elegy: A Memoir of a Family and Culture in Crisis, described by the National Review as a “brilliant book” and by The Economist as “one of the most important” reads of 2016. Ron Howard and Brian Grazer of Imagine Entertainment have announced plans to produce a movie based on Vance's book. J.D. Vance’s campus visit is part of the UT Humanities Center’s sixth annual distinguished lecture series. The event is free and open to the public, but tickets are required for entrance. UT's Clear Bag policy will be in effect.